rumours that some suspected military men were going around public and private schools, and injecting pupils and students in the area with monkey pox virus. According to the rumour, the alleged vaccination is the cause and spread of the Monkey Pox, and had led to the death of some pupils in the metropolis. It was also rumoured that some pupils allegedly injected by the suspected military officers were reported unconscious. So when the rumour hit the waves, many students and pupils in schools in the area scampered to safety. At about 11:25am many parents besieged the schools of their children to withdraw them and prevent them from taking the ‘killer’ vaccination. At the Oak Special School located along the Unity FM Road, some parents were sighted scaling the fence to take their children. Their action, Daily Sun gathered, was because the school management refused to allow parents to take their kids. It was the same situation at the Presbyterian Schools located along the Old Enugu Road. The school managers locked the gate as well. While many parents besieged the gate, younger ones among them were sighted trying to scale the fence. Daily Sun, however, sighted some mobile policemen in five Hilux vans, patrolling many schools in the area apparently to douse the tension and arrest the rumour mongers. At the St. Patrick’s Urban Primary School Abakaliki, a primary five pupil, Nwafor Chisom, told newsmen that nobody or group came to the school to vaccinate the pupils. 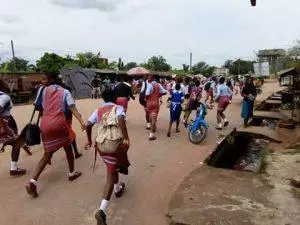 He said that there was rumour that forceful immunization of pupils was on in some parts of the state and that some pupils have died as a result of the vaccination. “I am afraid of what I heard and most of my colleagues have been withdrawn by their parents but I can’t go home because I want to receive my lessons,” he said. The Headmistress of the school, Mrs. Chioma Okorie described the rumour as unfounded and baseless. She said a team of policemen visited the school following the rumour. Meanwhile, the State Commissioner for Health, Dr. Daniel Umezurike, dismissed the rumour as baseless. He therefore called on people to disregard it and stop panicking. “There is no such injection going on in the state and there is no casualty anywhere in the state. People should discountenance the rumour. We are making arrangements to track down these rumour mongers and handle them accordingly for disruption of public peace” he said.